This rock looks just as if it were the human hand. However there is a stick which looks like a snake to the left of the image. Therefore this image became the one with profound meaning to show that snakes prevent mankind to turn their thoughts to Stone gods even though Stone god turned into the rock just like human hand　with the hope that mankind would admit the presence of Stone gods some day. The left half of human body expresses the thought of consciousness and the right half of human body expresses the direction to which the subconsciousness proceed. This rock shows the left hand when seen from this side and it seems to mean the world which is composed by human consciousness. The snake in the left side might show humans are ruled by the snakes of the Ruler's Stars in the real world. This image shows the human legs. The other side of the legs in the left image show the direction to which mankind go ahead. You can find foot finger in the lower part of the right leg. This side of the right image shows the direction which the legs go ahead. The top of the foot can be seen clearly under the left leg. Both the images show the knee of the right leg becomes very thin and it looks as if it is going to crumble. The right leg shows the direction to which human subconsciousness proceed. The thin knee seems to show humans don't admit the world of subconsciousness. If this should knee crumble, it might show humans have no ablity to admit the world of subconsciousness. It also means humans can't admit Stone gods. If the beings from the stars think humans don't have the abilty to know the world of subconsciousness, it means the purpose to have made mankind get futile, because Stone gods made humans to know the presence of Stone gods after they were solidified by the Ruler's Stars. According to the beings from the stars , if the beings from the stars should decide there is no possibility that mankind admit the presence of Stone god, the earth would turn into the planet with only sands with pebbles on which no creature can live. Even though humans were made to know the presence of Stone gods, there is no value for them to live on the earth if mankind can't admit Stone gods. Then the world of subconsciousness give a signal and the world which can be acknowledged by consciousness is to be erased. However the warnings are to be given to mankind so that they can acknowledge the presence of subconsciousness. The abnormality of natural phenomena is one of the warnings. 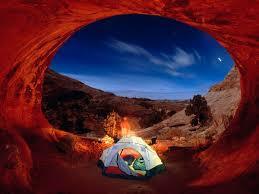 We mankind can't help admitting the abnormality of natural phenomena getting worse and worse year by year. It shows the warning to mankind is getting harsher and harsher every year. The abnormal weather may be chipping the right knee of the leg of Arches every year. I wonder which is earlier, humans acknowledge the world of subconsciousness or the right leg of Arches will be broken. 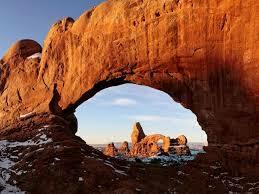 The rock is attached in order to reinforce the arch. 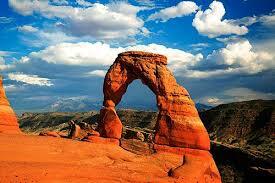 Can you see the string to bind the supporting rock and the arch? Since we usually strap the support with the cord when we make the support, I can't help imagining that the rock is strapped by the cord when I see the above photo . 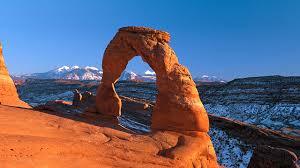 Please refer to the following web pages as to Arches National Park of Utah.